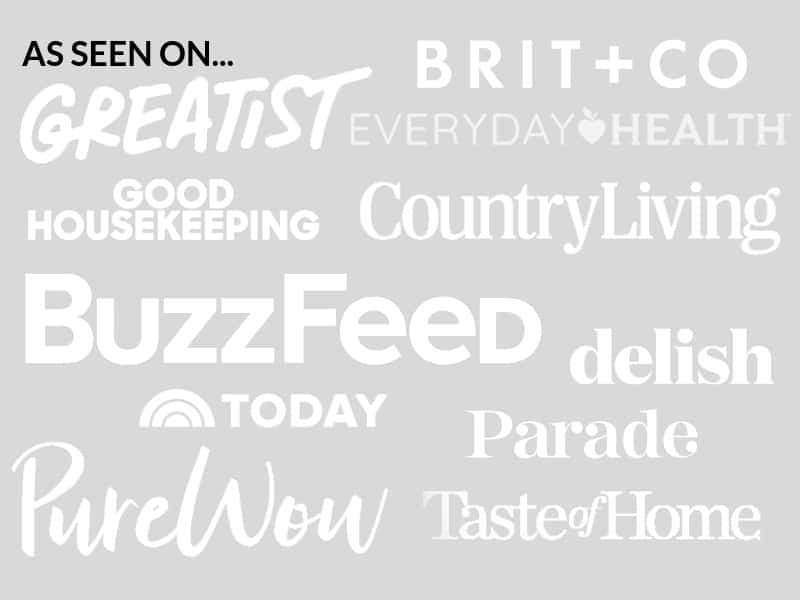 August 8, 2017 By Elizabeth Lindemann 2 Comments / This post may contain affiliate links. Whenever I have a craving for Chinese food, I always have a tough decision to make. Get take-out, which includes driving at least 25 minutes each way, knowing it’s not going to settle well? Or make it myself? Lately, I’ve been opting to make it at home more often- a cheaper and healthier option. 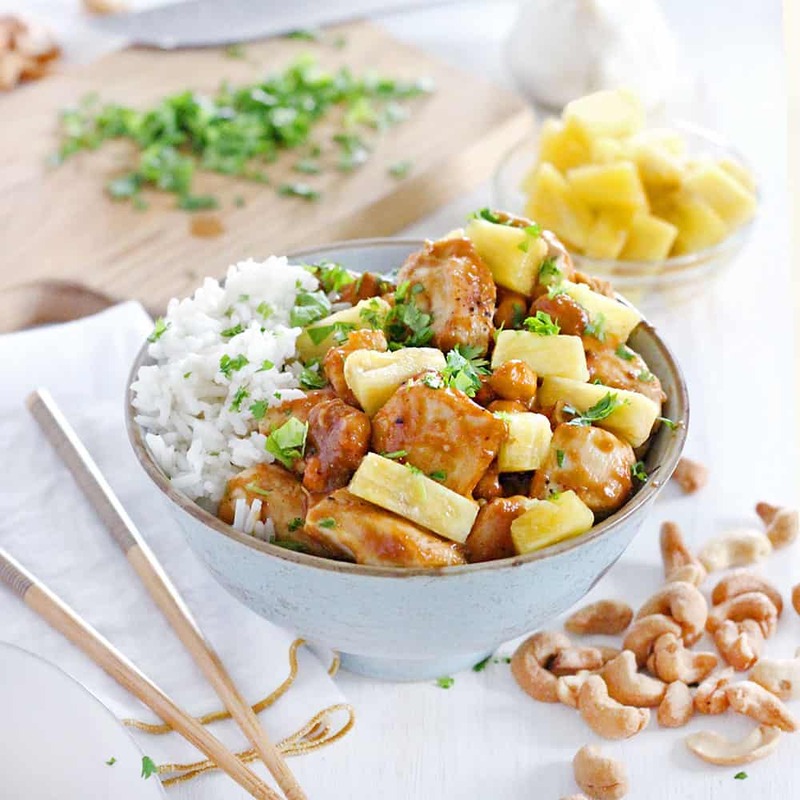 I made this Skinny Pineapple Chicken with Cashews the other day and wow… absolutely delicious! It was easy to make, it’s low-fat and healthy, it settles well, and tastes amazing. AND, it doesn’t have any added sugar! The sauce is AMAZING. The sweetness of the pineapple is just enough to make a slightly sweet brown sauce, complimented by a hint of spiciness from Sriracha sauce, umami from soy sauce and toasted sesame oil, earthiness from garlic, coriander, and ginger, and acidity from rice wine vinegar. ANDDDDDDD, the whole meal only takes 20 minutes to make! This is the perfect recipe for this busy back-to-school time of year. The sauce can even be made ahead of time for an extra quick and easy weeknight meal, if you’re into meal planning. Yup, this is definitely being added to my regular dinner rotation. First, cook some chicken breast (or thigh) meat with a touch of oil, seasoned with salt and pepper, in a skillet. Then, make the sauce. Simply mix the ingredients together in a bowl or glass measuring cup. Lastly, heat up the sauce in the same skillet, add a slurry of cornstarch and water, stir until it’s thickened, and add some cashews and pineapple. That’s it! If you like making your own Chinese food at home, be sure to check out this skinny orange sesame chicken. And also, check out my friend Maggie’s blog, Omnivore’s Cookbook, for authentic Chinese meals you can make at home! Printable recipe below, including adaptions for making this gluten-free or Paleo/Whole30 compliant. 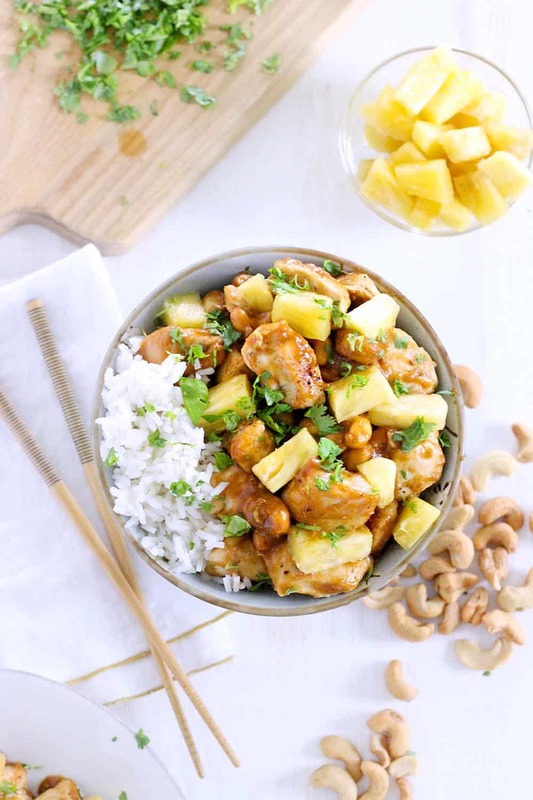 This skinny pineapple chicken with cashews is a healthy, low-fat stir fry you can make in 20 minutes! 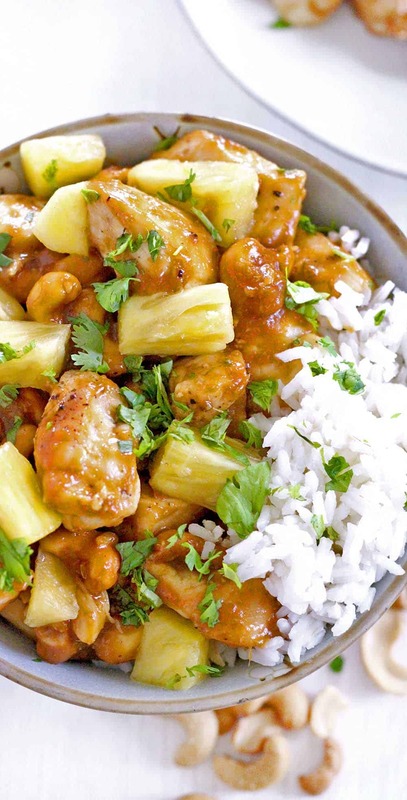 Naturally sweetened from fresh pineapple in a thick and delicious sauce brown sauce. Add the chicken to the skillet and season with salt and pepper. Cook chicken on all sides until browned on the outside and fully cooked, about 6 minutes. Meanwhile, mix together the garlic, ginger, rice vinegar, sriracha, sesame oil, and soy sauce, along with any pineapple juice that's been reserved, in a small bowl or glass measuring cup. Whisk together cornstarch and 1/4 cup water in a separate small bowl. Add the sauce to the skillet with the chicken. Then, stir in the cornstarch slurry. Heat over medium heat, stirring constantly, until thickened (about 3 minutes). 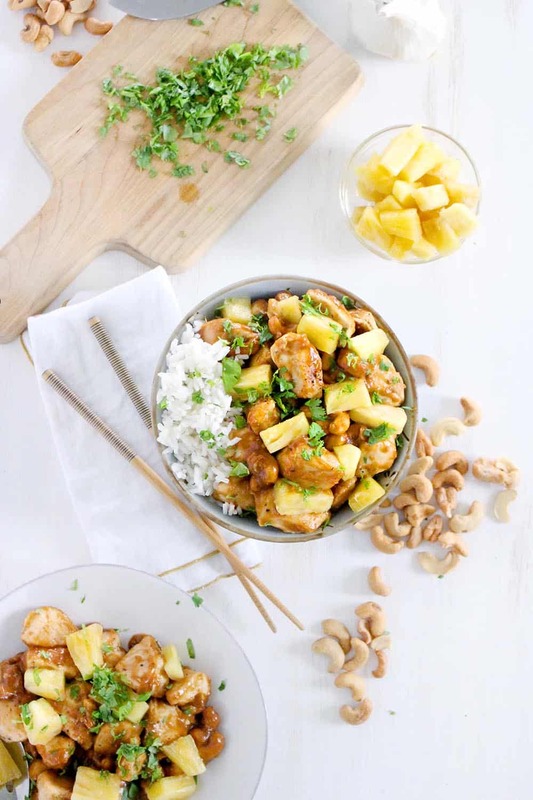 Add the cashews and diced pineapple to the skillet. Serve over steamed rice garnished with fresh cilantro. For easy weekend meal prep: mix the sauce together ahead of time and store in your refrigerator for up to a week. For a gluten-free version, use gluten-free soy sauce. For a paleo version, use coconut aminos instead of soy sauce and arrowroot powder instead of cornstarch.